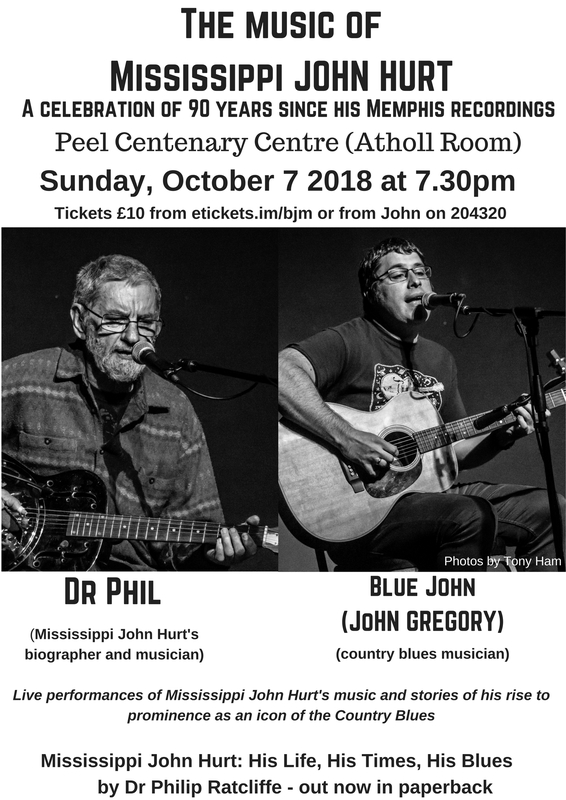 A CONCERT in the Atholl Room at the Centenary Centre in Peel on Sunday, October 7 will remember the life and times of country blues legend Mississippi John Hurt. The show, featuring Mississippi John Hurt biographer and musician Dr Phil and country blues musician Blue John (John Gregory), will celebrate the 90thanniversary of Hurt’s legendary 1928 recordings in Memphis for the Okeh label. Dr Phil (Phil Ratcliffe) – who wrote the critically acclaimed biography Mississippi John Hurt, His Life, His Times, His Blues, will be performing Mississippi John Hurt songs as well as telling stories about the guitar legend’s rise to prominence as an icon of the country blues. The biography is now available in paperback. There will also be a set by Blue John, a country blues guitarist who is a huge Mississippi John Hurt fan and has opened shows for a number of leading blues and roots music performers both in the Isle of Man and the UK. John lives in the Isle of Man and is also part of the blues duo Blue John and Papa Cass and a concert promoter and guitar teacher. Dr Phil and Blue John will also team up for some duo performances as part of the show. They are no strangers to performing together as they were the special guests during world-renowned country blues guitarist Ari Eisinger’s 2017 British Isles tour.